Alavis strongly believes in the Tawheed (Oneness) of Allaah which, according to them, is not only limited to Allaah but also applies to His representative as well i.e. A person of highest religious status (Saheb-e-Maqaam or Hujjat)who in the religious hierarchy is the topmost spiritual authority in his time, may be the Prophet or the spiritual master (imaam) of his progeny or his missionary (da’i) in their respective times. They believe in the Tajreed of Allaah which implies that the Creator (Allaah, khaaliq) is entirely different from the Creation (makhlooq). Creator is always complete and His Creation is always incomplete. Religion of Allaah (shari’at) is a path that is taken by the Creation to transform itself from incompletion to the completion under the guidance of the Prophets of Allaah. Creation is totally dependent on its Creator. 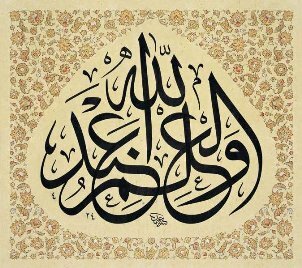 They believe in the Tanzeeh of Allaah which means that the Names of Allaah (al-Asmaa ul-Husnaa) does not at all apply to Allaah The Almighty but to His first creation ‘First Intellect’ (aql-e-awwal) who accepted the Call (da’wat) of Allaah on its own. The core of the Isma’ili-Taiyebi faith is to believe in the unseen things (ghayb) and in the succession of those spiritual authorities who had remained guardian of the Mission of Allaah, right from the first Prophet Aadam till the present day. The utterance of this faith is recited in each and every prayer. This belief states that, Heaven (Jannat) is true, Hell (jahannum) is true, Resurrection (ba’ath) is true, Balance of deeds (mizaan) is true, Way for Salvation (siraat) is true, Accounts of actions in the Grave (hisaab) is true, Angels (malaa’ikah) are true, Jinn are true, Reward for right-doers (thawaab) is true, Retribution for wrong-doers (‘azaab) is true, Day of Resurrection (qayaamat) is true, for Forgiveness of a believer the Intercession of his Imaam (shafaa’at) is true, this Material World (duniyaa) will get destroyed (faani) is true and the Hereafter (aakherat) will always remain (baaqi) is true. Alavis believe in Prophet-hood of the divine Prophets and the divine books and messages revealed upon them i.e. nubuvat-risaalat of Ambiyaa-Mursaleen, Vicegerency of the People of Prophet (ahl ul-bayt) i.e. wasaayat of Awsiyaa, the institution of supreme spiritual and temporal leadership from the progeny of the Vicegerent of the Prophet i.e. the imaamat of A'immat (pl. of imaam) and the call or mission (da'wat) of the missionaries (du'aat) of the Imaam. The Isma'ili faith, unlike mainstream Islaam, is based on the tradition of hierarchical appointment. In the case of an Imaam, the predecessor Imaam appoints his successor only from his sons and this goes on from father to son in the progeny of Prophet Mohammad ul-Mustafaa (saws). In the case of a Da’i, the predecessor Da’i can appoint his successor not only from his sons but also from the people of Da’wat ranks who deserves the post having the highest state of knowledge, wisdom and governance. Each authority at the lower rank has to work with total devotion and submission to the one at the higher rank. There cannot be any compromise or self-captivation in it. The religious authorities who work with Ma’zoon and Mukaasir are known as Hudood in the Isma'ili terminology. The hadd (a person of a rank with special duty - pl. hudood) at the upper rank demands total obedience from the hadd at lower rank. Thus, the Isma'ili faith is a religion of subservience (tabaa’at) and obedience (itaa’at) to the Spiritual authorities (darajaat-e-ruhaaniyah). No dissent in any form is ever permitted. A beginner or an outsider is not at all allowed to discuss about the religious intricacies unless he knows the basics of Isma’ili-Taiyebi faith. If he has some query then he can ask and consult the religious authority, but only after the acquisition of a necessary primary knowledge of Islaamic faith (shari’at). Reason behind this is because of the fact that it is not based on the sole literary meaning or grammatical interpretation or translation of the Qur’an with the disposition of the lawful deeds but its very essence is obtained only by knowing its hidden implications (baatin) and esoteric meaning (ta’weel). Isma’ilism in general and Taiyebism in particular, deals with the allegorical interpretation of the pillars of Islaam, a peculiar Isma'ili philosophy on unity (wahdaaniyat), creation (takhleeq), cosmology (aflaak), eschatology (mabda’-ma’aad), institution of Prophet-hood and Imaamat. Therefore, an Isma'ili-Taiyebi believer should submit himself to the authority of the Imaam or his deputy Da’i unquestionably on the powers and orders regarding religion, family and society with the strict observance of customary obedience to the higher rank of the religious hierarchy. Only those at the advance stage of learning could aspire to know the hidden meaning of Islaamic thoughts and tenets. Due to this reason the Da'i take strict oath of allegiance (bay’at-mithaaq) from his follower in the name of the Imaam of present time (imaam uz-zamaan) so as to pledge his absolute loyalty to the Imaam or the Da'i and his sincerity to follow Isma’ili faith in each and every aspect of his life. Walaayat - Love and devotion for Allaah, His Prophets, Imaam and his representatives (du’aat pl. of da’i).